You can use Shared Notes on emails to communicate with other users with whom the email is shared with through Shared Labels. For every conversation, you will find a box in the Hiver widget on the right side of your Gmail where you can write and view Notes. Shared Notes can be created and seen by any user who is a member of the Shared Mailbox. And if you don't use '@' at all, the Shared Note will stay there as a comment which can be seen by anyone reading the email. By using the Reply button on Shared Notes, you can write replies to the original Shared Note, such that it will be directed to the sender of the original Shared Note. For ex. 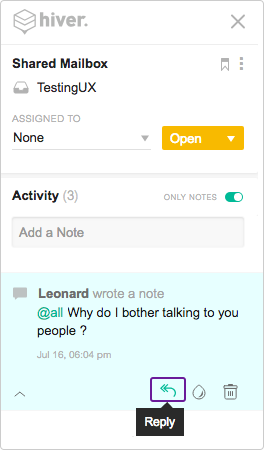 Shared Note1 was written by Leonard. 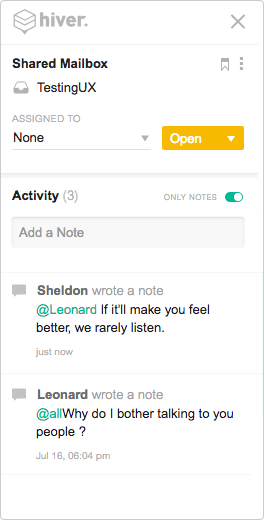 When Sheldon writes a reply to Shared Note1 using the 'Reply' button it will be addressed to Leonard, using @Leonard. You’ll then be able to choose a background color for the note.